Drown your reflections in a pool of liquid brilliance! If you appreciate the potential of black paint, this is the kit for you. The BLACKFIRE BlackICE Whiplash Kit contains everything you need to create a mile-deep shine that radiates with energy on black and dark colored cars. This kit doesn't just push the limits of what you can expect from dark paint, it explodes through them! Don't just turn heads... Create whiplash with the BLACKFIRE BlackICE Whiplash Kit. Each product in the BLACKFIRE BlackICE Whiplash Kit is designed to work together to help you create a shine unlike anything else. BLACKFIRE formulas are the result of over twenty years of research with state-of-the-art polymers from Germany, Sweden and the US. BLACKFIRE waxes and sealants wipe on and buff off easily without streaks or hazy patches and with a shine that can last for six months or more. All BLACKFIRE products are surface-friendly and VOC compliant in all 50 states. These water-based formulas clean, condition, polish and protect without the strong solvents found in most car care products. BLACKFIRE BlackICE Hybrid Montan Sealant Wax is the next generation of premium car wax. The perfect blend of refined ivory carnauba wax, purified montan wax and BLACKFIRE's Wet Diamond Polymer System, BlackICE creates a glistening shine across dark-colored paints. Not just a beauty wax, BlackICE offers extreme water beading and environmental protection for your automobile's paint with outstanding durability. BLACKFIRE BlackICE Hybrid Montan Sealant Wax can be applied on top of any BLACKFIRE paint sealant or by itself. Anyway you choose to apply it, your dark-colored paint will reflect with a liquified shine! 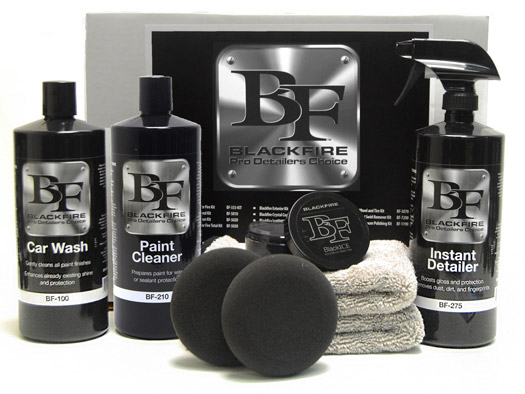 BLACKFIRE Paint Cleaner creates a wet-look shine while visually reducing swirl marks. It cleans the paint of old waxes and sealants and prepares the paint to accept a wax or sealant. BLACKFIRE Paint Cleaner is a non-abrasive polish and glaze combination. Used before BLACKIFRE BlackICE Hybrid Montan Sealant Wax, BLACKFIRE Paint Cleaner improves the gloss and clarity of the finish. BLACKFIRE Car Wash Shampoo cleans your vehicle and renews the shine every time you wash your car. BLACKFIRE Car Wash Shampoo is fortified with the same Wet Diamond tri-polymers used in our Blackfire Paint Sealant. These polymers increase washing lubricity, encapsulating loosened grit to reduce washing swirls. They also improve water sheeting to prevent water spotting. This makes BLACKFIRE Car Wash Shampoo an excellent choice for washing black, red and dark color vehicles. BLACKFIRE Instant Detailer�is a supercharged blend of Ivory Carnauba Wax, Wet Diamond polymers, and high lubricity cleaners. This makesBLACKFIRE Instant Detailer the ideal choice in maintaining the shine created by BlackICE without altering the look. BLACKFIRE BLACKFIRE Instant Detailer�buffs out easily and leaves a streak-free shine, even on dark colors. Enjoy the satisfaction of a just-waxed vehicle any time, instantly! BLACKFIRE Instant Detailer�gives wax the boost it needs to go the distance. Use these microfiber detailing towels for drying, buffing, or as a finishing wipe down. Microfiber is designed to be light, strong, super-absorbent and quick drying. The fibers are non-abrasive, and are woven so tightly that it�s absolutely lint free and extremely durable. Unbelievably, these ultra-tough fibers are engineered to absorb seven times their weight in moisture. Color may vary. BLACKFIRE Foam Wax Applicators are designed to make applying an even coat of wax or sealant easy and effortless. The thick foam pad glides easily across the paint leaving the an even coat behind. Use them to apply BLACKFIRE BlackICE or BLACKFIRE Wet Diamond Al Finish Paint Protection. A total retail value of $159.99. You save $44.99!